A high school team purposely misses free throws as a show of support for an opposing player. The coach never considered any other option. It didn’t matter that his DeKalb, Ill., High School basketball team had ridden a bus two and a half hours to get to Milwaukee, then waited another hour past game time to play. Didn’t matter that the game was close, or that this was a chance to beat a big city team. Now that Alex Rodriguez has slithered back to his ex-wife, the Yankee slugger’s reported paramour Madonna is furious. "Madge is pissed!" reveals an insider, after A-Rod headed home to Coral Gables, Fla., in the wake of his steroid-use scandal. "Alex ran right home to Cynthia, and to Madonna, this is the ultimate dis." According to our source, the Queen of Pop is mostly livid because A-Rod didn’t come to her for solace. "But Alex’s handlers want to make sure he’s as far from Madonna as possible," says the insider. "He has enough negative publicity as it is." NEW YORK (SI.com) — Alex Rodriguez has admitted to using performance-enhancing drugs from 2001-2003, ESPN is reporting. On Saturday, Sports Illustrated broke the news that Rodriguez had tested positive for two anabolic steroids in 2003. When reached for comment at a Miami gym last Thursday, Rodriguez told an SI reporter "You’ll have to talk to the union" and "I’m not saying anything." During the interview with ESPN’s Peter Gammons, Rodriguez said, "When I arrived in Texas in 2001, I felt an enormous amount of pressure, felt all the weight of the world on top of me to perform and perform at a high level every day. Back then, it was a different culture. It was very loose. I was young, I was stupid, I was naive and I wanted to prove to everyone that I was worth, you know, being one of the greatest players of all time. And I did take a banned substance…. (CNN) — Olympic gold medalist Michael Phelps admitted to "regrettable" behavior Sunday and vowed it wouldn’t happen again after a British newspaper published a photograph of the swimmer smoking a marijuana pipe. "I engaged in behavior which was regrettable and demonstrated bad judgment," the record-setting American athlete said in a statement issued Sunday. The competition isn’t the only thing he’s been smoking! 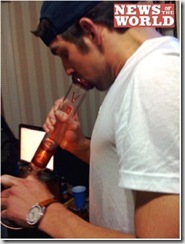 Olympic hero and 14-time gold medalist Michael Phelps has been caught cradling a glass bong – a scene so potentially damaging to his career that his representatives allegedly tried to buy off the British newspaper in an attempt to kill the story, the paper reports. Jeff Monson is either really dumb or really smart. I’m leaning towards the latter. What has happened to our heros of yesteryear – in our apple pie sport, no less?